Lake Serene. If I had just one day to show a visitor the backcountry of the Cascade Mountains, Lake Serene would be near the top of the list. It has everything the Cascades has to offer, yet it’s only a 40-minute drive out of Everett, and Everett itself only 25-minutes north of Seattle. Yep, Lake Serene has everything; except solitude that is. Lake Serene is no secret and it’s best to hike in early to beat the crowds. 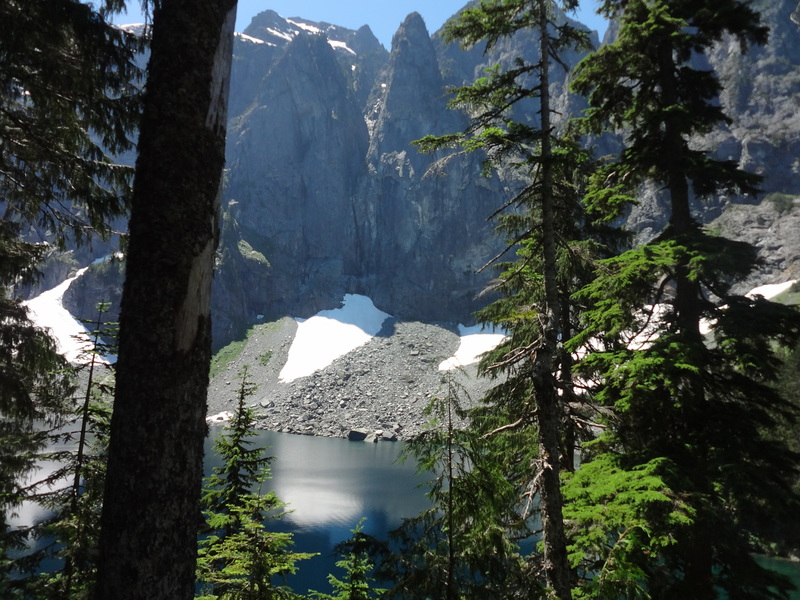 All within a 3 ½ mile hike (7 miles round trip) are magnificent waterfalls, huge old-growth trees, towering peaks and topped off by an alpine lake set dramatically in the pinnacles of Mt Index. Even the drive to the trailhead is pretty, once you pass the commercial clutter of Monroe and Sultan, with highway 2 following the sparkling clear Skykomish River dominated by the jagged cliffs of Mt Index and the improbably leaning peaks of Mt Baring. Take highway 2 east out of Everett past the tiny town of Gold Bar, and seven miles later turn right onto the Mt Index Road for another ½ mile to the well signed trailhead. A Northwest Forest Parking Pass is required to park here (available at sports stores and U.S. Forest Service ranger stations). The trail starts off easy, gently rising through a pretty, second-growth forest with huge mossy old stumps bearing witness to the giants that once stood there. At 1 ½ miles you reach a signed junction; to the right Bridal Veil Falls, to the left Lake Serene. Climb the short but steep trail to the falls, they’re well worth it. Returning to the junction continue on towards Lake Serene on an easy trail through a shady valley, across a footbridge to a waterfall filled grotto and begin the climb to Lake Serene. Fill your bottles with water here as there is little until you reach the lake. I’d normally rate the climb up to Lake Serene strenuous due to the 1,300 foot elevation gain in the next 1 ½ miles, but the trail is so well built and maintained that I’d call it moderately strenuous, and if you’re in shape even moderate. As you climb up from the valley bottom watch the forest. It becomes park-like with little underbrush and massive Douglas Firs, Red Cedars and Western Hemlock trees begin to appear, some exceeding six even seven feet in diameter and reaching over 150 feet into the sky. The steep slopes protected these patriarchs from the loggers that cleared the lowlands below them a hundred years ago. As you hike along the pinnacles of Mt Index peek through the forest now and again giving you a glimpse of your destination and before you know it you’re topping out and, . . . there it is. Sparkling in the sun Lake Serene is set at the base of the two thousand foot spires of Mt Index which seem to rise directly out of the water. On the north side of the lake the grey granite cliffs are punctuated with white snowfields hanging from them while a network of developed trails gently guide you to picnic spots on the south and east (no tables or facilities at the lake except a pit toilet). The trail ends on a large dome of smooth granite that plunges into the crystal clear lake. The rock surface is clearly etched with parallel lines where bygone glaciers scoured the rock (glacial striations). This spot makes an excellent lunch spot (and diving platform into the chilly waters of the lake). After spending the afternoon lounging in this magnificent place, it’s time to go. The good news is, its downhill all the way back (almost).